Update: The two posts on this subject have been combined for a short post at The Atlantic. Thanks again for the thoughtful feedback. Thanks to all of you who left comments in response to the recent story out of Richmond, Virginia, about the decorative art that was attached to three statues along Monument Avenue. The goal of the protester was to remind visitors and others that Richmond’s history extends beyond its preoccupation with its Confederate and may have also wanted to show that the monuments in question were erected at a time when African Americans were barred from local government and the kinds of conversations that directly shape how a local community remembers its collective past. I’m suggesting that’s an overly narrow framing of the issue, which should be: who gets to decide what messages take up our public space TODAY? Your view strikes me as giving too much privilege to the white supremacists who put up all the monuments in the first place. Just because they had that power once doesn’t entitle their “monuments” to deference for all time. I respect your scholarly approach to this, but I disagree – I’d rather see these monuments removed to a “Museum of Racism”. I thought I would take just a few moments to clarify my position. First, I don’t believe that monuments to the past necessarily warrant an indefinite life span. I can think of any number of examples where I believe the removal of monuments and memorials are justified from the toppling of statues of King George III at the beginning of the American Revolution to the pulling down of Saddam Hussein in Baghdad. In those two examples, however, their removal functioned as part of the end of a government or revolution. I’m sure we could just easily come up with other examples justifying the removal of a historical marker of one sort or another. In the case of Richmond’s Monument Avenue and most other public historical sites, however, I have trouble seeing what removal accomplishes given the other options available. And it it is the fact that there are other options available that makes this so difficult for me to understand. For me, Richmond’s memorial landscape functions as an organic whole. The Arthur Ashe Monument only works because it is on the same street as Jefferson Davis, Robert E. Lee, and Stonewall Jackson. The same holds true for the new additions to the grounds of the state capital, the American Civil War Museum at Tredegar and countless other places in the broader Richmond area. Touring these sites together opens up a unique window not simply on the history of the Civil War and race relations, but on the history of American democracy. The sites themselves track the range of voices that had to fight to earn the right to engage in public discussions concerning what and how Richmond’s past is remembered. In short, they track the history of a community’s values. Most importantly, a community demonstrates its willingness not to brush aside controversial and/or embarrassing aspects of its past. The Robert E. Lee monument is one of my favorite places to bring students. It allows me to share stories about the history of Lee, the development of Richmond in the late 19th century, Jim Crow, and historical memory. It’s not an academic exercise, but about trying to help shape reflective and caring citizens. Teaching history and visiting historic sites is, in part, about learning how to empathize and appreciating the extent to which the past shapes who we take ourselves to be. For better or for worse they are part of our story, but each of us has the choice as to how to engage these places. We can express outrage over their existence, reflect carefully about their history, place a thoughtful marker to make a statement or just let them be and appreciate their aesthetic qualities. It works for your students because you are there interpreting. When you leave it becomes a monument to white supremacy again. I think the rich array of monuments and historic spaces tells us something interesting about the community as a whole. I would also suggest that we place this memorial landscape within a broader narrative of how Richmonders have come to terms with their Civil War past. All of the museums in the city offer visitors numerous opportunities to reflect on how many of these sites fit into this story. So putting up a monument to one black athlete makes all the monuments to white military leaders (who also betrayed their country and their oaths to same) A-OK? Sorry, a monument isn’t history – it’s only a memorial to that history. And how we choose to remember our history shapes our future. You might be able to put the REL monument into a non-racist historical narrative, but I doubt that is true for the vast majority of visitors to Richmond. Now, putting up monuments to US Grant and Lincoln, as well as Martin Luther King and Rosa Parks, might even things out a bit, but as long as we treat Confederate Generals as heroes, the truth about the War and what it was fought for will never win out against the Lost Cause narrative. That’s not what I said. It’s not a matter of simply placing monuments in attempt at achieving some sort of balance. I am not even sure what that would mean in this context. 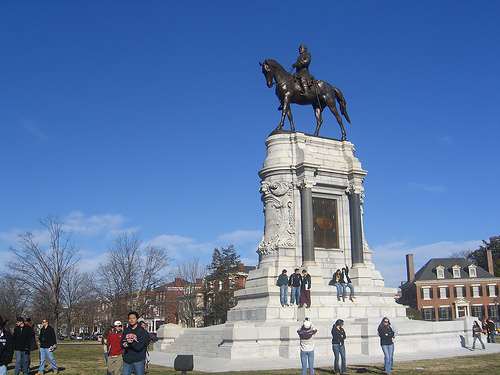 It is true that for many people who visit the city those monuments are interpreted as straightforward homages to Confederate leaders, but whether that continues depends on a host of factors. The example that came to my mind first was Nazi symbols in Germany after the Second World War. Saddam Hussein also came to mind. It had never occurred to me that there were once statues of King George III in the colonies, but I guess it is obvious. I really resist going to Lord Tryon’s Palace in New Bern. He figures directly in the lives of some of my ancestors who lived very near the site of the Battle on the Alamance. I really appreciate your mentioning the fact that African Americans had no say in where statues and monuments were placed during the late 19th century. I had not thought about that before, and it gives me a new perspective on the discussion. When the Saddam statue was torn down in Baghdad It was the image that flashed in my mind. This is the first time I’ve seen the Alamance ever mentioned in a forum/blog/group. I was driving along on a CW tour when I saw a sign for it, As I had never heard of it I felt obligated to check it out, I was impressed with the visitor center and it’s presentation and I learned something I hadn’t known about. It is a nice site of an overlooked yet important event. Thanks very much for this thoughtful and complex follow-up. Really interesting stuff here. I agree that monuments are an important part of our collective past and can tell us a lot about it. I suppose part of my problem is when they become a somewhat unquestioned part of our present–I can’t tell you how many times I have heard from students about Robert E. Lee as noble, anti-slavery, returning reluctantly to fight because his native state had been invaded; while that narrative comes from many places, I think it certainly relates very directly to the monumental versions of Lee produced after the war (cf. Connelly’s The Marble Man). Obviously we can use monuments to talk about that kind of narrative, to analyze it, to think about where and how it develops, and what other histories it reflects and illuminates. But as was said earlier in this thread, in many if not most cases those approaching a monument aren’t doing so in the context of those discussions, and are much more susceptible to the idealizing narrative itself. I’d even say that the Ashe statue can amplify that–making it seem that this is a group of American heroes, from Lee to Ashe, different but sharing a fundamental heroic ideal. Y’know? That doesn’t mean we should get rid of the monuments, but it does to me argue for making the monuments themselves more complex and dialogic–finding ways to add some of those other voices, not just near them or alongside them but on them, in their own narratives and details (perhaps in new placards, for example). I suppose part of my problem is when they become a somewhat unquestioned part of our present–I can’t tell you how many times I have heard from students about Robert E. Lee as noble, anti-slavery, returning reluctantly to fight because his native state had been invaded; while that narrative comes from many places, I think it certainly relates very directly to the monumental versions of Lee produced after the war (cf. Connelly’s The Marble Man). This is a point that could be made in regards to any monument to history. We tend to bring assumptions that have little to do with a critical understanding of the past. How many of our students accept the image of Lincoln as the “Great Emancipator”? I assume you don’t believe that this would justify adding to or removing the Lincoln Memorial. Fair enough, and last one from me as I don’t like to overwhelm comment threads, but I’ll just say that I’d say the dividing line (about when to add or respond) is whether monuments are raised for the very central purpose of propagating propagandistic and distinctly mythic versions of the past. Which is, to be clear, what I would say the Lee monuments, and most of the Lost Cause ones, were raised to do. That doesn’t mean that a monument has to do (or could do) full justice to all the complexities of the past (although I wouldn’t mind adding language to the Lincoln Memorial or any other, no; they’re not set in stone, even though they are). But again, if it’s central purpose is to propagate a mythic history, I’m especially on board with countering that myth pretty overtly and centrally as well. No disagreement there, Ben. Than again I think that most monuments are by definition meant to push a certain propagandistic or mythic version of the past, which I don’t think is necessarily such a bad thing. If you read the news reports it is clear that the individual in question went out of his way not to damage the monument. It doesn’t appear to be vandalism as in the case of what happened last week in Lee Park in Charlottesville. Is that really all you have to add? The statues are a part of American history, ones that should not be removed or destroyed, but should be used to explain our shared history, the good and the bad. How else are we to learn from history if we destroy large parts of it? The news reports called it “street art”. I call it vandalism because those plaques had no business being on there. Vandalism usually involves an intentional destruction of property, which does not seem to be the case here. Whether the plaques have any “business” being on the monuments is another issue altogether. Kevin, we know that immediately after the war, regiments placed memorials on battlefields to record their service there. Later, usually around significant anniversaries, the same vets held fundraising drives to purchase more elaborate monuments, usually adorned with sculptural features reflecting late 19th or early 20th century styles. Do you have a problem with the removal of the original monument which may have had a more organic connection with the period of the war? Yes, I would have a problem with the removal of those monuments and markers as well. Would the erection of a monument on a site preclude the subsequent erection of another monument, since it would likely entail the removal of the first for at the very least aesthetic reasons? Is there a “first in time, first in right” rule here? A local Catholic college near my home on Long Island named a new building after the late CIA director William Casey. This is a memorial to him. Many local people here are of Central American descent and consider Casey a war criminal and have asked for the removal of the plaque with his name on this building. Apart from the merits of their charges against Casey, is it your position that once Casey’s plaque went up it should never come down, but only be interpreted? Let me be clear that I am not making the argument that once a monument is dedicated that it cannot be altered, removed and/or moved. I am very comfortable with leaving these decisions to local communities, which is how I would respond to your second question. I am simply sharing my own perspective on the subject. I tend to oppose removal for most monuments and prefer alternative interpretation signage. However, I was sympathetic to the extralegal removal of the references to savages on the Santa Fe monument and I am also sympathetic to removing William Casey’s name. Whatever the reasons for their initial installation, these enormous monuments to the nobility and majesty of The Lost Cause (or Southern Heritage or white supremacy) are not coming down anytime soon. The powers that (still) be in Virginia and elsewhere in our nation are far too invested in their view of these men and whatever it was that they want us to believe that these men fought for to allow these monuments to come down. heart of the Confederate war against the United States. You know, as I read the really good comments here a thought suddenly occurred to me: One day the Lost Cause monuments will be removed. That is true isn’t it? It will take another generation or more likely two, but some future southerners will come to look on the monuments as something akin to public hate speech and remove them to some museum store room. Lets hope not. A Lost Cause statue to Robert E. Lee is now history itself and should be preserved for future generations so that they can understand the historical complexity of America. Should Jefferson’s Monticello be bulldozed down because of the evil Jefferson exercised there? Why stop at Confederate monuments when there are so many proto-Confederate monuments to go after as well? Regardless of what I have to say, ultimately it is up to individual communities to decide whether they will continue to make the effort to preserve such sites. Lyle, I’m glad you brought up Monticello. This is a spot where I think Kevin’s idea of adding onto existing memory is working very well. If you visit Monticello now you’ll see that slave life and culture is a central part of what is presented to the visitor (something which I understand is a very recent development). It is not possible to visit Monticello without confronting the central paradox of Jefferson’s life, which is that this brave and eloquent prophet of freedom and human dignity was himself a slaveowner. This has been such an interesting discussion so why respond in this manner? Probably to further the discussion Kevin. He did bring up the idea of having a museum of racism, did he not? He did and I appreciate your contributions as well. I just don’t want to see this discussion get sidetracked. I didn’t mean to overreact. Kevin, since you lived in Richmond, I just wanted to know if statues there are as ignored as the hundreds of historic statues and monuments here in NYC are? We have “Remember the Maine” and General Sherman, Columbus, and Horace Greeley. Few people who live or work in these neighborhoods could even tell you who the “immortalized” man down the street is. I guess it depends what you mean by “ignore”. No doubt, many people probably don’t give these sites much serious reflection in their day to day lives, but that should not be surprising. Perhaps that is a reflection of just how engrained they are in our local communities. For a small portion of the community they no doubt add a great deal of meaning to their lives and neighborhoods. In Richmond, they receive a great deal of attention from local museums and other historical institutions. My impression is that there is more of a coherent ideology of commemoration in Richmond, whereas in New York the number of memorials is so great and the messages so at odds with one another that none are seen as really representing the city. Many. like Washington’s Arc d’ Triumphe in Washington Square Park are known to everyone on sight but rarely connected to the personages they claim to honor. Perhaps the most beautiful memorial is the Arch at Grand Army Plaza, which Brooklynites love to show off, while at the same time having no idea that something called the Grand Army of the Republic existed. On the other hand, the Ground Zero Memorial has the advantage of being in the spot where the event commemorated occurred. It has the weird advantage that those of us who lost relatives and friends, practically everyone in New York and the surrounding suburbs, knows that the dust of our loved ones still likely fills the space. One difference at least initially, between the 9-11 memorial and memorials like those erected to Confederate heroes or even Confederate soldiers comes from the pre- and post911-attack politics. Most New Yorkers did not know we were at war with al Queda, so there is a decontextualizing of the event and its commemoration from the motives of the killers. Post attack politics also plays on memory. My guess is that many, probably most, New Yorkers who lost loved ones disagreed with the conduct of the Afghan war and strongly opposed the Iraq war. And unlike Lincoln, New Yorkers did not come to values the virtues, such as they were, of George W. Bush. When New Yorkers visit Ground Zero, I think that most don’t think of the causes of the attack or celebrate the Bush’s military strategy thereafter, but see it as a place of loss. The heroism that is celebrated there is the bravery of men and women trying to save strangers, not of those trying to kill terrorists. As you say in your essay on 9-11, the next generation will own the meaning of the memorial, and the strong desire of so many current New Yorkers to cut it off from the nationalist or anti-Muslim narratives that seem popular in some parts of America may be doomed, depending on what Texas’s textbook board decides is the correct interpretation. I have struggled with this question for some time. My studies of how communities of memory developed with black and white Baptist churches in early 19th century Georgia and of how the souvenirs carried away from the Chickamauga reunions in the 1880s and 1890s remind me that the issue that is most important in thinking about memory is the fogetting that is a part of the process. I quite like the artist’s approach to the Richmond monuments. A counter memory has been inscribed on a site of memory that had previously been allowed to sit uninterrogated. The site of memory, thus, becomes a place rich with opportunity to create a new community of memory. But the conversation has to work back and forth — the old memory has to be constantly put in tension with alternative rememberances. As Larry points out if the sites continue to be uninterpreted/unchallenged the old memory, working through images aimed to create veneration, will continue to exist as it has for decades in a broader field of power. While in my grouchiest moments I sympathize with those who call for removal, I continue to believe that the best way to confront the memorial spaces/places of memory created by a nation steeped in white supremacy is to call them what they are, examine alternative memories from the time when the sites/monuments were created, and continue to broaden the conversation about how memory is created and the stakes involved in the creation and the continuance of these markers. Thanks for taking the time to comment and you make a number of important points. I quite like the artist’s approach to the Richmond monuments. A counter memory has been inscribed on a site of memory that had previously been allowed to sit uninterrogated. I don’t think there is anything wrong with placing wayside markers that provide some background to the site in a way that does not damage the integrity of the site. Best of luck with your work with the Chattanooga History. My sense of the artist’s work was that it did not damage the monuments. If I am mistaken, then I would most certainly take a different view. But, in lieu of an official (in my mind a rather problematic move when it comes to creating communties of memory) interpretive marker, I still think the reminders of the tenseness in memory making is quite helpful. In fact, the juxtaposition of media is quite powerful in my mind and calls into direct question the conceputal integrity of the memorial. Again, if the physical integrity of the monument was impacted in a way that created a physical threat to structure itself then I might think differently. In fact, the juxtaposition of media is quite powerful in my mind and calls into direct question the conceputal integrity of the memorial. Again, if the physical integrity of the monument was impacted in a way that created a physical threat to structure itself then I might think differently. One thing we should be learning through this site and many of the looks back at the Civil War, is that violence in public issues is very, very seldom appropriate. Would the American Revolution have been as divisive and damaging as it became, without extremism (reflected in destroying symbols of Royal government) that placed loyalty to Britain outside the acceptable community? Would Iraq have become, as it still is, so damaging to those linked in any way to Saddam Hussein, and thereby dividing a society already very damaged? History, which it seems should be a primary interest of anyone reading this blog, can serve many purposes. One lesson should be clear, using past facts to justify present prejudices is loaded with dangers. I was once in a church group discussion where it was bemoaned, as is common, that Americans have a lack of historic grasp. I suggested that is one reason this country/society works as well as it does. Suppose all those horrible things done to different groups by other groups, across the world, were kept as daily issues here in 21st century America? We have descendents of the many Balkan ethnicities. We have people with Turkish and with Armenian ancestry. We have… well… everyone is invited to fill in their particular example. There are far too many. Perhaps the New Bern, North Carolina example gives us a good clue. Most of my family were close to Alamance, the area where the Regulators were active and defeated by Royalists. I’m not at all sure which way they leaned. I can learn the issues on both sides of the fight and come to an understanding that works for me, today. The emotions of those past conflicts should also be in the past. Understanding them is our job, for the present and future. One of the problems with Kevin’s approach is that in Richmond, the white supremacists have taken up most if not all of the good memorial spots. The Arthur Ashe memorial is a perfect example of this: it is literally at the end of the line, behind a string of white supremacist icons. The civil rights memorial at the capital is another: it is in a corner of the grounds, and though it is a beautiful and successful piece of public art, it is overwhelmed by the rest of the grounds and the interior of the building. There is even a statue of Lee right on the floor of the old House of Delegates meeting room. The overall impression is of a city and state completely dominated by white people, with a couple of small concessions to African Americans on the fringes. Here in Charlottesville it is the same story: Lee and Jackson Park with their heroic, militaristic equestrian statues dominate downtown, along with a statue of a Confederate soldier. At UVa there is now a really good installation documenting and commenting on the history of African Americans at UVa, but the central grounds are still dominated by a lily-white version of the University’s history, complete with plaques honoring UVa Confederates attached to Jefferson’s iconic rotunda. There is one very small, easily missed marker in the pavement that alludes to the workers “both free and enslaved” who actually did the labor to build “Mr. Jefferson’s University”. My point is that a truly balanced, honest public accounting of the Civil War, slavery, Jim Crow, and the Civil Rights movement in Virginia and elsewhere in the South is going to require removing some of the old monuments built to celebrate and cement white supremacy. I don’t expect this to happen in my lifetime if ever (I’m less optimistic than Larry Cebula), but I can dream, can’t I? To be specific, here’s my dream: the statue of Lee at the head of Monument Avenue is removed to The Museum of Racism, and is replaced by a statue depicting USCT troops marching into Richmond in April 1865. In Charlottesville, Jackson Square becomes Emancipation Square, with Jackson’s statue replaced by a piece of public art that celebrates the end of slavery in the Commonwealth of Virginia. The confederate soldier stays, but is shifted over a few yards to make way for his new neighbor, a statue of a freedman in his USCT uniform. Thanks once again for taking the time to comment, James. One of the problems with Kevin’s approach is that in Richmond, the white supremacists have taken up most if not all of the good memorial spots. Are you seriously suggesting that everyone involved in the development of Monument Avenue was a white supremacist? As a historical explanation it doesn’t help much at all given the many factors that went into its development. Of course, one of the things that has to be taken into account is the fact that African Americans were not involved in the public discussion about how the city would remember its past during the Jim Crow era. No one who is serious about this disagrees with you, but that was not what motivated the organizations and individuals involved. Be careful what you wish for. Why believe that removing any of these monuments would necessarily result in it being replaced with anything having to do with the Civil War? These issues must have a public component. Jackson Park in Charlottesville becomes a memorial to ______________. I guess my point is that calling for the immediate removal of these monuments doesn’t necessarily get us any closer to a richer and more inclusive public memory of the past. Once again, I must conclude that a monument to USCTs in Richmond is much more meaningful if it doesn’t involve the removal of Lee. Are you seriously suggesting that everyone involved in the development of Monument Avenue was a white supremacist? This is clearly a rhetorical question, but I’ll bite. What I am suggesting is that the lineup of Confederate heroes on Monument Avenue is a powerful display, and daily reminder, of white supremacism. I think this is exactly what was intended by the people who put them up, and it is why I’d like to see them taken down. It is indeed a powerful display, but to what extent it reminds people of white supremacism is anyone’s guess. I still think your claim fails to get us very far in understanding Lee’s place in historical memory at the turn of the twentieth century. Would you then also agree that public commemorations in the North that include references to Lee are driven by the same goal? Lee came to dominate much of our collective memory of the war as a nation, which suggests that his rise was the result of many factors. Sorry about the disrespectful tone. No apology needed, Kevin. Would you then also agree that public commemorations in the North that include references to Lee are driven by the same goal? Lee came to dominate much of our collective memory of the war as a nation, which suggests that his rise was the result of many factors. I yield to David Blight and his masterful Race and Reunion on this question. To paraphrase Blight, the “reconciliationist” approach to Civil War commemoration and memory served many purposes, none of which had to do with justice for African Americans. That reconciliationist narrative is also at work in the Lee monument, which can be judged by much of the coverage it received from Northern newspapers. We agree re: the question of whether it had justice for African Americans as one of its goals. The old saw that the winners write the history doesn’t apply to the American Civil War. After it was over the Yankees went home satisfied with their win and the Rebels went home and began making excuses. Their version went unchallenged until recently. Now there is pushback, discussions like this were unheard of just 20 years ago. I think we’re blurring the line between the lost cause narrative, which was largely an argumentative written exercise, and the monuments which were more traditionally commemorative. To understand whether a monument had a political motivation you would need to know when it went up, how funds were raised for it, what the connection was to the community, and what was said at the dedication and by whom. I would suggest monuments put up while the veterans were still alive were completed as a commemoration of their service, whether the monument went up in Cleveland, Ohio or Columbia SC. Art is speech and I believe the corrective for speech individuals find offensive is not less speech, but more. Minds aren’t changed by making ideas, images, or speech off limits. The genius of the Constitution is it provides a framework to protect speech and allow for ideas and viewpoints to be tested by public debate, with hopefully evolving national consensus being the result. The real threat to consensus, and the most divisive course to follow, is to close discussion even if it is done with good intentions. Last night, I chatted with a friend who happens to be African-American. He is also pretty much from my neck-of-the-woods (South-Side Virginia and Eastern North Carolina and the rest of the Tidewater). He also has experience with Richmond. We’ve usually agreed on a lot of issues. We also agree on this one. Give it another generation or two. Already, most twenty-something’s of any ancestry don’t pay attention to most of the things any of us have been bothered about. There is a loss in understanding about some of the real conflicts that have happened in this country. We do need to keep communication going. Monticello and the recent museum efforts in Richmond are doing very effective work along those lines. For me? I’m foolish enough on my own. I don’t need to add bitterness about the past. Nice article in The Atlantic. I realize that I am jumping in late to this discussion. While I cannot agree in any way with the positions to remove or to vandalize Confederate monuments anywhere and particularly along Monument Avenue, I think that the Richmond community, and the Commonwealth of Virginia for that matter, has an opportunity to tell the whole story of our shared history with slavery and the Civil War. How about a monument there to Anthony Burns, a slave preacher from Virginia (Stafford County) who triggered a national debate over the administration of the Fugitive Slave Act? He took extreme steps to defend what he believed in, namely his freedom, in a manner proportional perhaps to how Generals Lee, Stuart and Jackson defended their freedom. I remember the controversy that Arthur Ashe’s monument stirred when it was erected along Monument Avenue, but Richmond and the rest of us have come to accept its presence, which is appropriate and fitting. … I think that the Richmond community, and the Commonwealth of Virginia for that matter, has an opportunity to tell the whole story of our shared history with slavery and the Civil War. The interesting thing about Richmond is that the community is actively reflecting on its shared past through a number of projects. I highly recommend you check out The Future of Richmond’s Past.